Backstory: The Kaleidoscope created for the Annual Kaleidoscope Show! You are here: Home / Backstory: The Kaleidoscope created for the Annual Kaleidoscope Show! Area art lovers will get the chance to see the best of local artistic talent in the 15th Annual Kaleidoscope: AVA’s Holiday Show, which runs through Jan. 6, 2018 at Summit Artspace on East Market, 140 E. Market St., Akron. This year’s juried exhibition, organized each year by the Alliance for the Visual Arts, will be held in the main gallery at Summit Artspace on East Market. The exhibition is free and open to the public. Winners of the juried show were announced at the opening on Dec. 1. See below for the list of winners and their work. 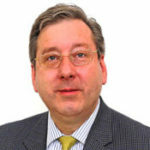 Patrick Melnick, Dean of Academic Affairs at Virginia Marti College of Design in Lakewood, served as the juror for the show. 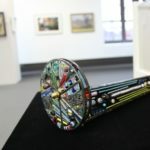 Gallery visitors will be able to vote for their favorite piece to win the coveted Kaleidoscope Award, a working kaleidoscope designed and hand-blown by glass artist Bob Pozarski. The winner will be announced at the gallery during First Night Akron, Dec. 31, at 8 p.m. Summit Artspace on East Market will be open from 6-9 p.m. for the end-of-year event. Sue Mencini was the 2016 People’s Choice winner.